This episode of Telly award-winning Knitting Daily TV with Vickie Howell is about putting your best foot forward with knitted socks and slippers. Vickie is wearing the Minnette Pullover by Cassie Castillo, featured in Knitscene, Winter 2012. Along with Host Vickie Howell, sock book author and designer Cathy Carron guides us through the history of knitted socks and demonstrates how a World War I-era sock was made. Give it a try with a spiral sock pattern based on a pattern that is over 100 years old, but updated for today. Download the pattern for Cathy Carron’s Do The Twist sock pattern. Sponsored by Sixth & Spring Books. Vickie asks British sock designer Rachel Coopey of CoopKnits how she got into sock knitting and why she thinks socks are the perfect knitting project. Katie Startzman, author of The Knitted Slipper Book guides us through the steps of making adorable felted slippers. Download the pattern for Katie Startzman’s Sunday Morning Scuffs. This pattern has been updated as of 8/1/14. Sponsored by Melanie Falick Books/Stewart Tabori & Chang. 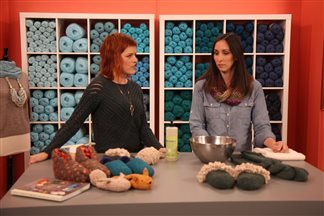 Vickie Howell wraps up this episode with a technique for attaching an easy crocheted sole to your slippers.